cyberseraphic » Hooray, I’m musical again! 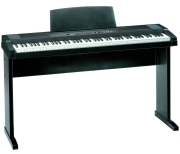 Today I bought myself a Roland EP-97 Digital Piano, thus ending a very long musical drought. When I was living in Adelaide, there used to be a piano in the house, but after I moved to Sydney, I no longer had access to any musical instruments (not counting my two recorders). There was a brief period towards the end of last year where I was playing on a crusty old upright piano belonging to one of my housemates, but he sold it before I had half a chance to practice a tune. I’ve also borrowed violins for various gigs in church, but had to return them soon after the performance. Its not like I’ve ever owned a violin before anyway, so no great loss there.